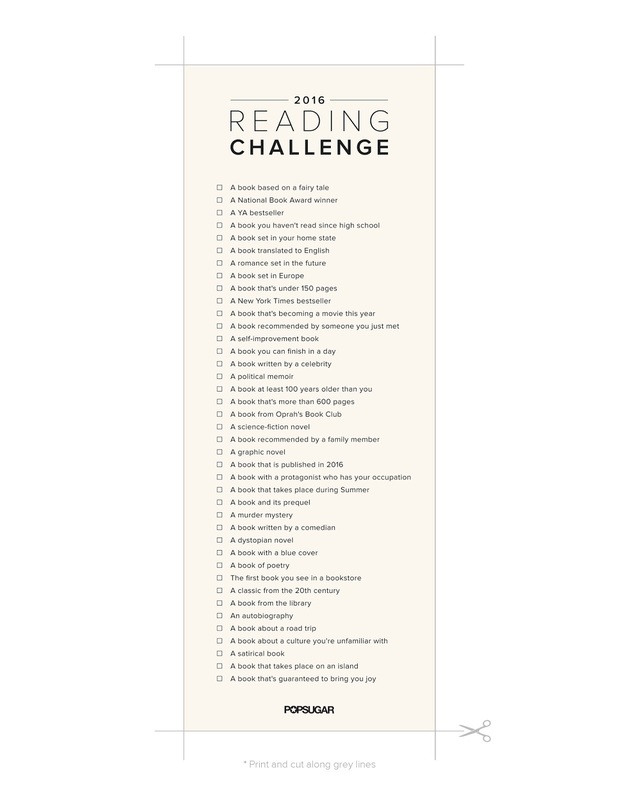 It's time for the new PopSugar Reading Challenge! I had people questioning where I got my list for my reading challenge I kept posting about last year - this is it! Not sure how long they've been doing it, but this is my second year for the PopSugar version of an Ultimate Reading Challenge. I will be reading to try and fit these interesting categories again this year, although I did have to type the list out myself and then numbered it for my own convenience. There's only 40 items this year (instead of 50 in 2015), but since I barely finished half last year, I should still have plenty to choose from in 2016. The biggest benefit to the challenge, for me, is that it really keeps me reading. One of the weird challenges in my life is deciding what to read next. With the list, I go search my local library's digital download options. I'll frequently cross-reference that with the GoodReads results for a particular category (cuz really, searching for the category on Google gives you people's GoodReads lists anyway). Overall, I just remember that there are no real rules, and this is truly just a guideline to keep me reading. I did accidentally read a few books last year that I could not make fit in any of the categories I had left, but I figured I was still reading, and that really was the big goal. 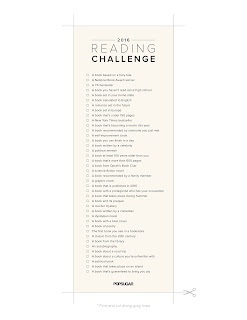 Will you be attempting the 2016 PopSugar Reading Challenge? A book that's under 150 pages will be hard to find! Interesting challenge. I finished about 46 on the list last year. Read 53. It does stretch your reading choices. I had no idea that this challenge existed! I am really excited to participate in it though. I love reading and it sounds really fun. If only I have the time, I will definitely go for this. Great that you are so into it. I wish I could make the challenge big enough so I can read it. I'm reading the Martian right now. I want to read it before I watch the movie. I'm always saying I need to read more. Unfortunately, I think 40 books may be a bit too ambitious for me. What a fun challenge! I read a chapter or two a night before bed, helps me relax. But it also takes me forever to finish a book this way! It's been a couple years since I've been able to read much, but I love reading so much. I remember seeing their list last year and wanting to do it. It looks like a great way to dip your toes in and either learn what you like to read, or diversify your reading!